Have you found it yet? The tiny little corner of heaven in Mt. Kisco, serving up some of the most delicious and creative food around? Little Crêpe Street is one of those special places that just makes you happy the moment you walk in. As you step through the door you can’t help but feel that you were just transported to a side street in the south of France, for a stroll through the cobblestones of the local market, and a stop here for the specialty of the house – a warm and delicious crêpe. I recently brought some tween-girls here for a “girls night out” and I was instantly a hero – it’s that kind of place. It’s hip and original, delicious and fun. If you’re looking for a way to score big points with your family, and turn your next family meal into a very special event- this is it! Then again- date night would do just as nicely here, or stop in with a friend for a quick lunch. This is the kind of place that works for everyone. The unique menu has a whole range of delicious foods for lunch or dinner, from interesting and healthy salads (Mangolicious Salad, anyone?) to savory and delectable main course crêpes- like my personal favorite, with crimini mushrooms, leeks, spinach and brie. 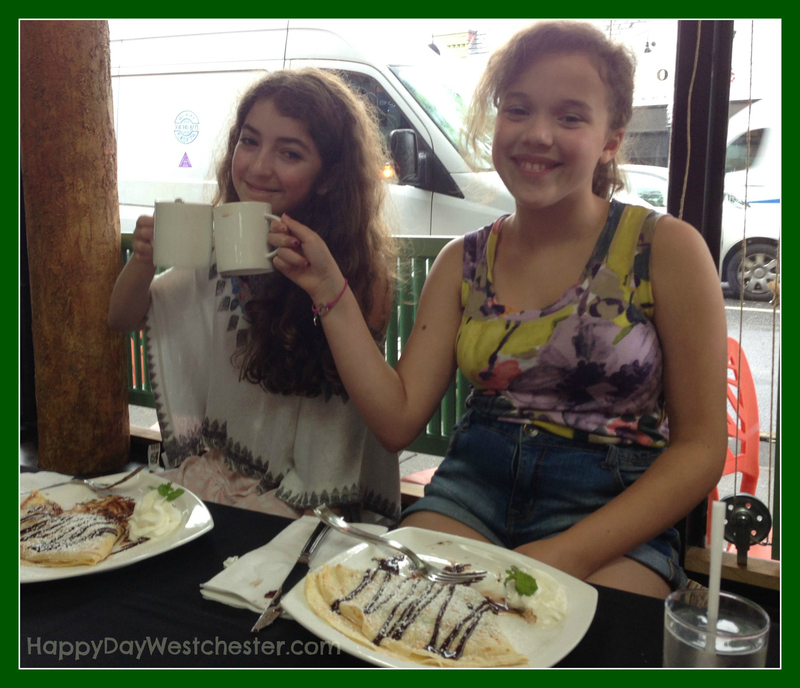 My tween girls gravitated towards the more familiar flavors of the mozzarella and pesto crêpe, and there are plenty of interesting choices ranging from exotic to western favorites. All of the salads and savory crêpes we have tried have been wonderful and well worth a trip to the shop…. The Campfire Crêpe just might be the best dessert, ever, anywhere. It arrives at your table beautifully presented, warm and oozing with homemade marshmallow, chocolate sauce and graham crackers. This is the kind of dessert that makes you close your eyes, eat really slowly, and start planning when you can come back to have it again. The girls were in heaven…and so was I.
We’ve also tried and loved the Banana Foster, the Dulche De Leche, and a Peach and Mascarpone special that was incredible. 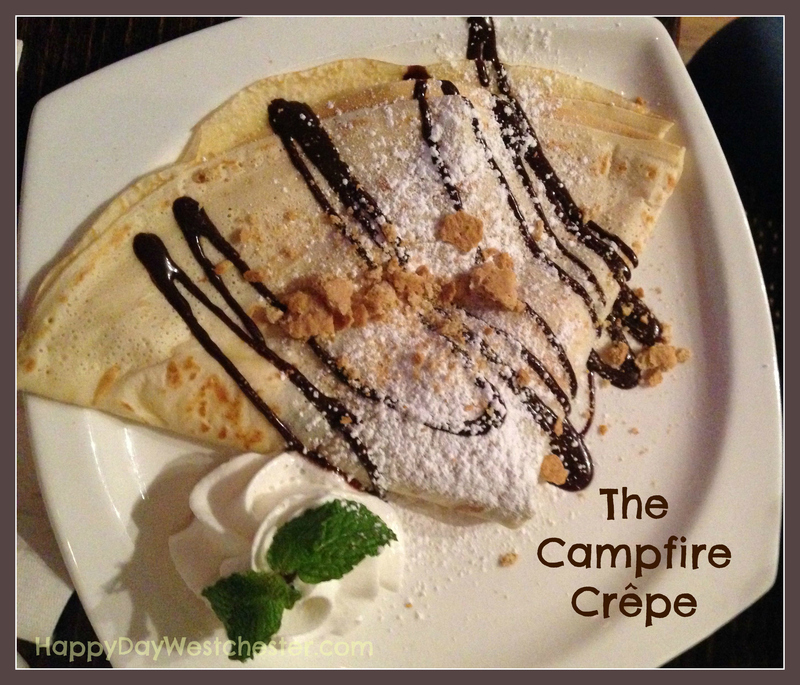 I really don’t think you can go wrong with a dessert crêpe here….but my heart belongs to the Campfire. Little Crêpe Street is totally unique, with great atmosphere, delicious and original food, and very reasonable prices. Home Run! The story continues, with two connecting sister shops, just as original and funky, which transport you to the streets of India. 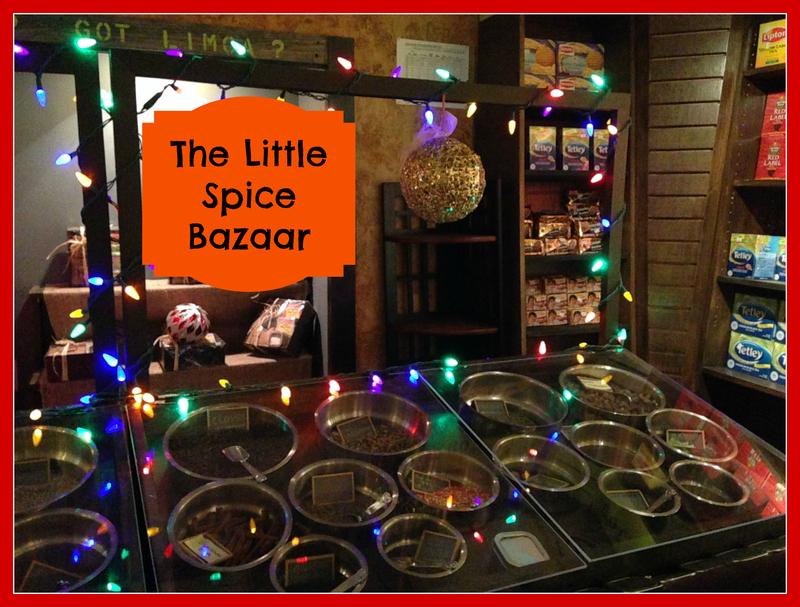 The Little Kabob Station, and The Little Spice Bazaar offer the tastes, sights and scents of India. One of the most endearing things about this trio of shops is that you can order from any of the shops from your table in Little Crêpe Street. Yes, you can bring your kids, they are welcome here, and will fit right in. I happen to have four kids with widely ranging likes and dislikes, so this place is perfect for us – we can order crêpes and salads for part of the family, Indian food for others, and for the littlest picky-eaters, there’s ice cream, fruit smoothies and hot chocolate. The last time we stopped in, Jonvie was our server, and she went above and beyond the call of duty to make a cranky and hard-to-please child happy. Thank you, Jonvie – you made the night perfect! On top of all this, perhaps the most wonderful thing about this restaurant is the way they have given back to the community. This is a post from their Facebook page just before Thanksgiving: “If you or your friends know of anyone or any families that due to certain circumstances are not really going to have an awesome thanksgiving meal like the rest of us kindly send them to Little Kabab Station / Little Crepe Street as we have a no charge policy for holidays as we believe that everyone deserves to be pampered no matter what… “ If that doesn’t make you love this place, I don’t know what will! Bonnie Saran is the owner of these three shops, and we have watched her business and its success grow by leaps and bounds, transforming a slightly run-down block in Mt. Kisco into a destination. It’s the kind of local success story that makes you want to say hello when you see her in the shop, and congratulate her. And you will see her in the shop – she is always around – which adds a lot to the warm and welcome vibe of Little Crepe Street. yum! this sounds amazing! i hadn’t heard of it, but i will def bring my kids — especially my older ones who are already huge crepe fans and will be very willing to experiment. but of course the younger ones are going to LOVE the campfire crepe for sure! love all three of those restaurants and the owner is delightful….